The reason this power cord came about was that we accidentally ordered several thousand feet of 20 gauge stranded wire instead of solid core wire for hookup wire in our kits. The mistake wasn’t caught until after some wire had been cut from each spool, so we were stuck with it. PB suggested we try making a power cord with it. I realized that we would need to use a couple lengths of wire for each conductor in the cord or it would really only be good for very low current applications, so we came up with a cord using twisted pairs that are braided together. It makes for a very flexible cord. We built a couple cords and I figured that would be that, they wouldn’t make the system sound any different than stock. I simply had three big spools of wire that would end up sitting in the lab forever. But then this most unexpected and puzzling thing happened, this cord actually made our gear sound better than our stock cords. We listened for about an hour the day we built the production protoype, comparing this new power cord to another prototype cord done with solid core rather than stranded wire, a sample of one of the upgrade power cords we previously sold, and one of the stock black molded cords we include with Bottlehead kits. We put one new cord on our prototype preamp, and then put another into my Tube Repro on my Nagra, and then swapped back and forth between the new cord and the other cords on both pieces of gear while listening to the same track. The six foot long cord came out pretty nice construction-wise (of course you can make it shorter if you prefer). There are six wires that are done up into three twisted pairs that are then braided into a nice floppy braid. The braid gets Techflex over it for style points. The AC plug is a nice clear hospital grade NEMA 5-15 model and the IEC plug is a right angle model, for a clean looking connection to Bottlehead gear. We found a hunky heat shrink tube with a 3:1 shrink ratio so that we can sleeve over the necks of the plugs as well as the cable. It’s adhesive lined and gets quite thick as it shrinks, which makes for what appears to be a super rugged and stiff strain relief at each end. I think one could actually grab the middle of the cable and yank the plug out of the wall without damage. The assembly is so simple that we have put up a web page for the instructions. You will need a cordless drill, wire stripper, a heat gun, a multimeter and simple hand tools like scissors and a screwdriver for assembly. How much current can the cord handle? Each leg uses two lengths of 20 gauge wire. Each time you double the cross sectional area of the wire the gauge number drops by three, so that is equivalent to about 17 gauge. We use the very conservative 700 circular mils per amp rule and rate it at about 3 amps, but you could probably be safe with up to about 10 amps, however – we have not tested it at that load and therefore do not condone the idea. None of our gear draws more than about 1.5 amps at startup and less than that once the power supply is charged up. The cord ought to work fine with all of our kits. At least for now we only have this kit available with a NEMA 5-15 style 120VAC 15A plug. The Seduction is the oldest kit in our lineup (selling well since 2001!) and it has some design elements that differ from our newer kits. One is that the IEC socket faces the wrong way for the right angle power cord. 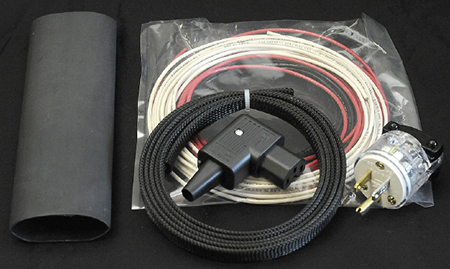 If you are ordering a Power Cord kit for the Seduction, please let us know and we will include a new IEC socket and wire that will allow you to replace the existing socket on the Seduction with a new one that is rotated 180 degrees from the original to accept the power cord. I admit to being somewhat skeptical at first but now I am a convert. I just finished assembling three power cord kits and for comparisons sake I put one on my Paramount pair and left the other with the original power cord. I can’t find the words to accurately describe what I am hearing, but the amp with the BH power cord definitely seems much improved. I tried several test recordings and switched the channels and the quality definitely stayed with the BH cord. I am sold, I will be buying new cords now with every kit I purchase this year. Great result from a purchasing error! Thanks Doc; for great products! There is a definite improvement with these power cords. Music is more open and seems to be quieter. Using it on my Eros and Extended Foreplay III. I just ordered another one for my DIY amp. OK, I’m sitting here “listening” to my just completed power cord, attached to the Crack, through the HD-600s. I would have never believed this if I hadn’t heard it myself. It’s more than a “tone control”, Doc. 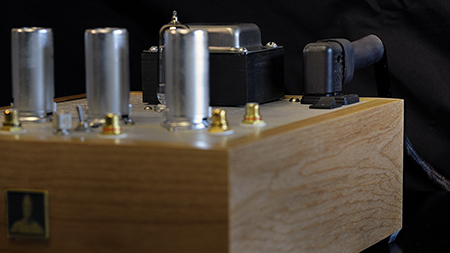 This power cord has made a marked difference in the Crack’s soundstage – it’s more forward. It’s a bit more open, it’s brighter – but in a really good way. And if it’s possible, the damned thing is quieter. More solid. Wow! I would have never dreamed… but I’m glad that I bought two kits. :-) The second one will go on my Musical Fidelity M1 DAC. Bravo! To whomever at Bottlehead mis-ordered that wire – I owe you a beer!